The Speaker of Montserrat represented the CPA at a panel discussion titled ‘Latimer House Principles – Two Decades On’ at the Commonwealth Law Conference and spoke alongside Dr Peter Slinn, Vice-President of the Commonwealth Legal Education Association and a member of the Executive Committee of the Commonwealth Lawyers Association; Justice Graeme Mew (Canada) and Hon. Marlene Malahoo Forte, MP, QC, JP, Attorney-General of Jamaica. Panellists examined the role of the separation of powers in the Commonwealth today and its effectiveness in providing democratic governance. During the panel discussion, Speaker Osborne also spoke about power and the role of the Commonwealth Women Parliamentarians (CWP) in advocating for greater equality for women in the various branches of government and about political violence against women that both prevents women from acceding to the positions of leadership and deprives both Parliaments and governments of women's contributions. Speaker Osborne called for a cultural shift about the definitions of power, the expectations on the government and the quality of political leaders to ensure that we have leaders who adhere to the Commonwealth Latimer House Principles as well as the basic tenets of democracy and equality. The CPA was a partner in the establishment of the original Commonwealth Latimer House Principles on the Separation of Powers, adopted in 2003, together with Commonwealth partners: Commonwealth Lawyers Association, Commonwealth Magistrates and Judges Association (CMJA), Commonwealth Legal Education Association and the Commonwealth Secretariat. 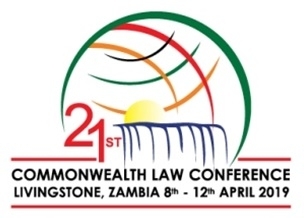 The 21st Commonwealth Law Conference was held for the first time in Zambia from 8 to 12 April 2019 and was hosted by the Commonwealth Lawyers Association along with the Law Association of Zambia on the main theme of ‘The Rule of Law in Retreat? Challenges for the Modern Commonwealth’. The conference brought together law professionals of all levels from across the Commonwealth to share their experiences and to promote the rule of law. The 21st Commonwealth Law Conference was opened by His Excellency Edgar Lungu, the President of Zambia and keynote addresses were given by Rt Hon. Lord Burnett of Maldon, Lord Chief Justice of England and Wales; Rt Hon. Patricia Scotland, QC, Commonwealth Secretary-General; and Senator Sekai Holland, former Zimbabwean Co-Minister of State for National Healing, Reconciliation and Integration.